Yesterday one of my friends asked me if there is some torrent client that runs on the command-line. I had no answer for him, but I think that you have some. Deluge is controllable by gui, web, and console. To setup remote access to a deluge server see the thinclient guide. I use rtorrent on a headless server to serve Debian and Ubuntu ISOs, works quite well and can saturate my network link. Dependencies and memory usage are minimal. aria2 (sf.net) is a multi-protocol & multi-source, cross platform download utility. The supported protocols are HTTP(S), FTP, BitTorrent, Metalink. It can download a file from multiple sources/protocols and tries to utilize your maximum download bandwidth. Yes. I use ctorrent as my primary client. Usually from within tmux. I was looking for a torrent client for ubuntu server a few weeks ago.I didn't found anything interesting but µTorrent server.It runs a web interface which can be accessible from serveraddress:8000/gui. Configuration manual is included in the downloaded package (You wont install it.Only configure it and run the executable when you want to use it. ).Be aware that this is a alpha version and it may have some problems.They say this version is only for 32bit linux but I used it on my 64bit server and I didn't experienced any problems. WebTorrent is a streaming torrent client for node.js and the browser. It also has a command line app. You need to have node.js and npm installed for using webtorrent. Torrentflux is available in the Ubuntu repositories, but I think in a quite outdated version now. Deluge can be obtained from the getdeb repositories. 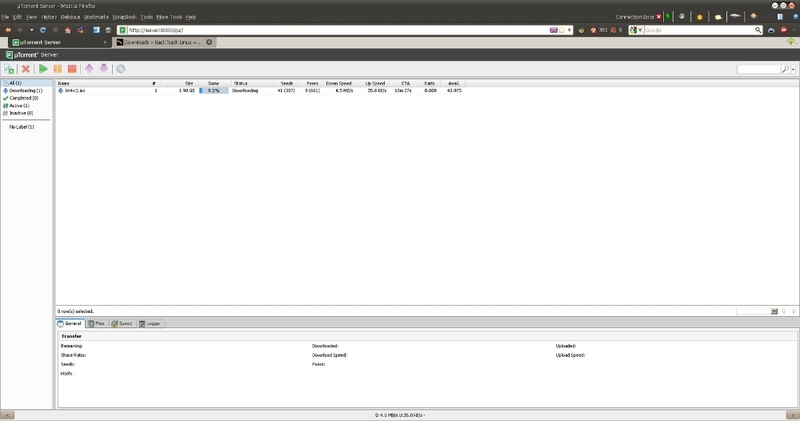 It also has a GUI client software that you could run from your desktop and connect to the "headless client" running on your server to control it. Or you could run install deluge torrent, run it as a daemon, and access it through Web Interface or remote apps (eg. Transdroid on Android). Not the answer you're looking for? Browse other questions tagged command-line software-recommendation bittorrent client or ask your own question. Is there BitTorrent software that runs in a terminal? How to create a .torrent using the command line? How to serve a torrent file? Which torrent client has command line arguments to start/stop downloads? How to download torrents from the command line?